Liverpool midfielder Jordan Liverpool latest news Daily star: Henderson is expected to sign a new deal with the Anfield side according to Daily Star. 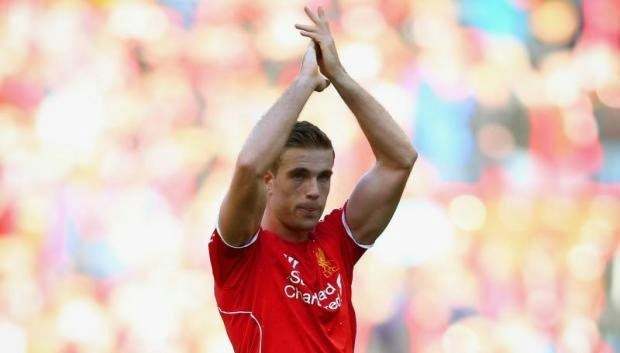 Liverpool midfielder Jordan Henderson is expected to sign a new deal with the Anfield side according to Daily Star. Jordon Henderson joined Liverpool from Sunderland for a fee around £18 million in 2011. The midfielder has netted 17 goals in 150 appearances for the Reds since his move. The Englishman has been one of the top players for Liverpool for the past two seasons. He scored a goal in yesterday’s 3 – 1 over Leicester City at King Power Stadium. Henderson who is the most hard working player for Liverpool has scored three goals in 18 games in all competitions this term. One goal was scored in the Champions League. After the departure of Daniel Agger, Henderson was named the vice-captain of Liverpool. Last weekend he captained the Reds against Stoke City as Steven Gerrard was rested. The 24-year-old is on top of Brendan Rodgers’ trusted player list. His current deal has still two-year-left and Liverpool are planning to offer him a better contract which will keep him till 2019. Henderson is the future captain of Liverpool if he stays at Anfield, Gerrard is likely to announce his retirement in the next few years. good news ! for lfc fans!